North Korean state media claimed the missile launched in the early morning hours of Tuesday, Japan time, was the very same one Pyongyang threatened to fire towards Guam in mid August. The missile, known as the Hwasong-12, is an intermediate-range ballistic missile that experts say could carry a nuclear warhead. The test fire over Japan fell short of North Korea’s proposed salvo of four missiles towards Guam, but could serve as an important test before commencing the Guam strike. 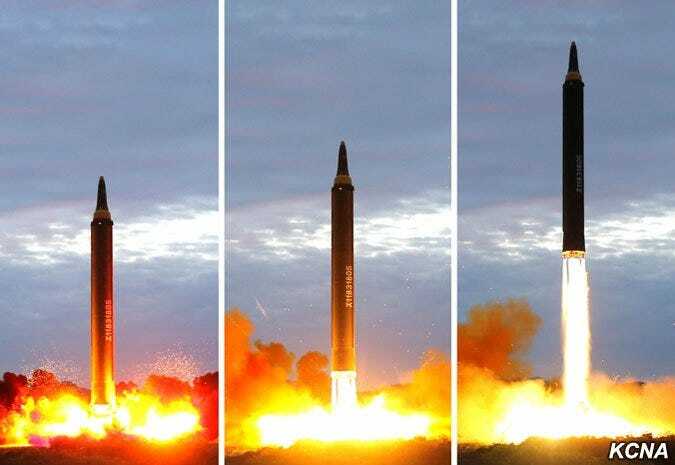 At the time of North Korea’s threat, Mike Elleman, the senior fellow for missile defence at the International Institute for Strategic Studies, told Business Insider an “important question revolves around the missile’s reliability,” because it had only been successfully tested once. Additionally, the single successful test was on a lofted trajectory, or shot straight up in the air instead of at an angle. The more recent launch over Japan may have filled a need for North Korea to figure out the reliability of the Hwasong-12 on a realistic trajectory. Importantly, Kim Jong Un never said he would not fire missiles towards Guam. Instead, he reserved the right to carry out a strike at a later time. Serious questions remain about the US and its allies’ ability to shoot down North Korean missiles, but the launch over Japan’s airspace promises to contribute to the militarization of the Pacific. The missile launch was condemned by Japan, China, Russia, the US, and South Korea.